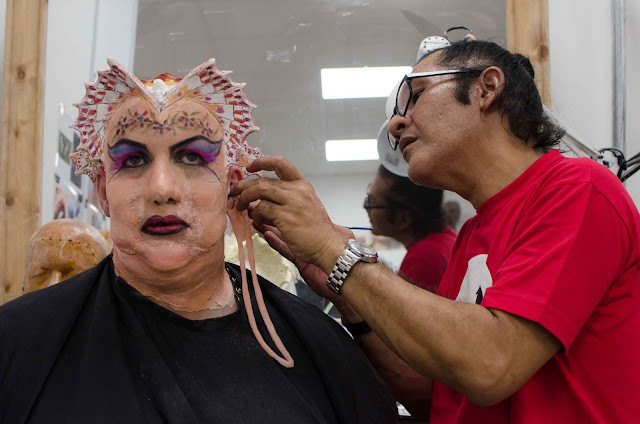 FAIZUL ZOULKIFLI – Abang Jay to the many who know him – has been a makeup artist for seven years in the local film industry. Some of the films he was involved in included Cun, Papadom, Sinaran and Jwanita. The 48-year-old has also worked on some of the wellknown faces in the industry including Ogy Ahmad Daud, Ning Baizura and Vanidah Imran. Still, this makeup artist has never stopped learning more about his craft. Three years ago, at the age of 45, he took 12 weeks off to attend a course in makeup for TV and film at the Delamar Academy in London. “You are never too old to pursue knowledge and improve yourself,” he says at a recent one-to-one interview with theSun. 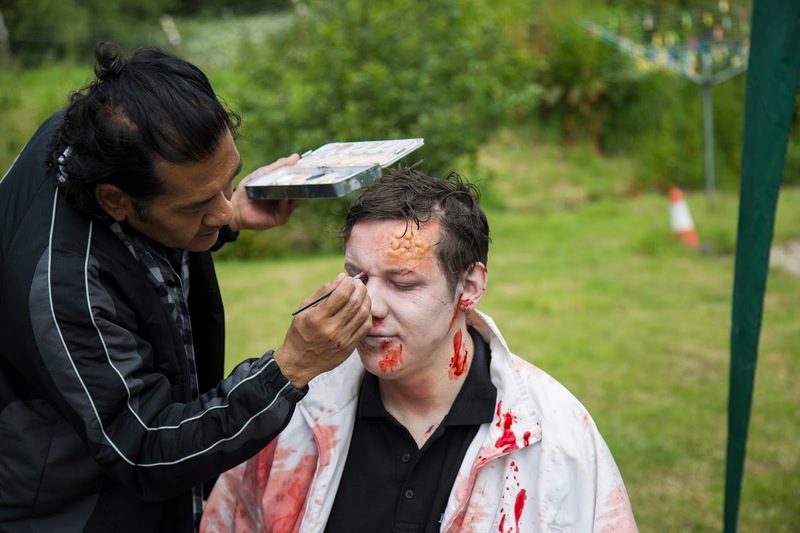 Abang Jay again returned to the UK last year for a fourmonth course on character and prosthetics makeup at the well-known Gorton Studio in Aylesbury. He explains that most makeup artists will opt for a ready-made moustache or ready-made bald cap when required for an actor’s role. But the courses he had attended had taught him to make a moustache and bald cap from scratch. It was the same with the moustache. He had to measure the space where he had to stick the moustache. All this measuring ensured that the bald cap and moustache would be more realistic on his clients, indirectly, creating a more realistic look for the character.But doing it requires a lot of detail work and perseverance. Now armed with a better understanding of prosthetics and makeup, Abang Jay can literally transform someone into as beautiful or as ugly a person as he wants. He can also tackle alien or horror looks with no problem. 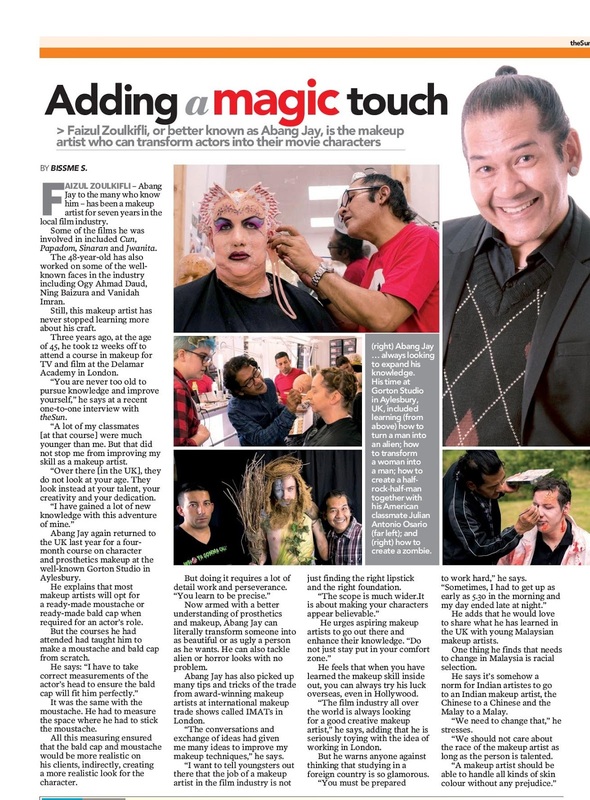 Abang Jay has also picked up many tips and tricks of the trade from award-winning makeup artists at international makeup trade shows called IMATs in London. 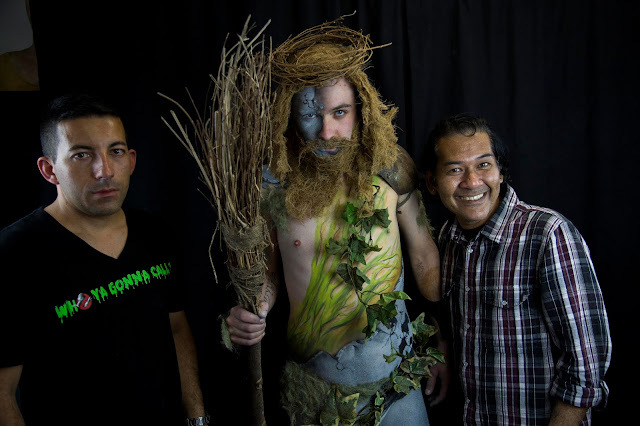 “The conversations and exchange of ideas had given me many ideas to improve my makeup techniques,” he says. He urges aspiring makeup artists to go out there and enhance their knowledge. He feels that when you have learned the makeup skill inside out, you can always try his luck overseas, even in Hollywood. “The film industry all over the world is always looking for a good creative makeup artist,” he says, adding that he is seriously toying with the idea of working in London. But he warns anyone against thinking that studying in a foreign country is so glamorous. “You must be prepared to work hard,” he says. He adds that he would love to share what he has learned in the UK with young Malaysian makeup artists. One thing he finds that needs to change in Malaysia is racial selection. He says it’s somehow a norm for Indian artistes to go to an Indian makeup artist, the Chinese to a Chinese and the Malay to a Malay. “We need to change that,” he stresses. “We should not care about the race of the makeup artist as long as the person is talented. A makeup artist should be able to handle all kinds of skin colour without any prejudice."